Measurements: FFT: Harmonics 1-63 of each phase of current, Volts, Power, impedance, phase angle. Energy: Active and reactive energy of each phase. Z = Phase angle between voltage and current PF of harmonic. 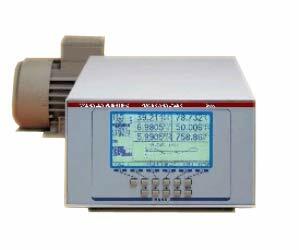 Extra Specifications: Economy Three Phase High Speed Power Analyzer 0.3% accuracy. DC-300kHz, 100mA-50A, 1V-1000V. Suitable for frequency inverters. All 3-phase values from same measurement interval. Inputs can be scaled (current, voltage, analog input). Line-to-line voltage. Harmonics 1-63, IEC1000-3-2 Measures dynamic processes such as loading of a motor. Measures torque on an electrical motor without using transducers. High speed data logging for dinamic processes. High speed dynamic torque measurement. Advanced operating software under Windows. Accuracy grade 0.05, 0.1, 0.3%.